The Diamondbacks spent a lot this off-season to make themselves contenders, but did they do enough to paper over their roster's holes? This week, SI.com is previewing all 30 MLB teams for the 2016 season, counting down to the No. 1 team in the league. At No. 17: the Arizona Diamondbacks. In our Wait ‘Til Next Year series in September, I wrote that the Diamondbacks “could be a front-end starter away from a return to contention in 2016.” Well, it’s next year, and the Diamondbacks have added not one but two significant arms to their rotation in 2015 NL Cy Young runner-up Zack Greinke and 25-year-old righty Shelby Miller, the latter of whom posted a 124 ERA+ in 205 1/3 innings for the Braves last year. Those two will combine with Patrick Corbin—who made a strong, 16-start return from Tommy John surgery last year—to form an excellent top three in Arizona's rotation. Behind that trio, the Diamondbacks have more talent on the way, with 24-year-old sophomore Robbie Ray likely to land one of the final two spots after an impressive rookie season and 23-year-old Archie Bradley and 24-year-old Braden Shipley as potential midseason reinforcements. Mix in a quality bullpen buoyed by the addition of veteran setup ace Tyler Clippard, and the Diamondbacks appear to have assembled a pitching staff worthy of their impressive young lineup. As strong as that lineup is, Arizona is going to miss Ender Inciarte—who was part of the package sent to Atlanta for Miller—more than it realizes, as will the pitching staff. The speedy Inciarte made 536 plate appearances in one of the top two positions in the batting order last year, posting a .343 on-base percentage and scoring 70 runs from those spots. He was also an elite defender, and those combined contributions made him worth more than five Wins Above Replacement per baseball-reference.com. 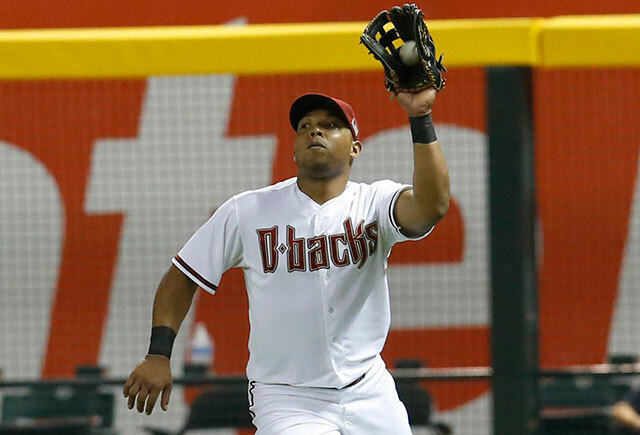 In Inciarte's place this season, the Diamondbacks will trot out fellow 25-year-old Yasmany Tomas, whose middling performance at the plate and brutal play in the field (both in the outfield and at third base) made him more than a win below replacement level in 2015. Moving off third base and having that rookie season and the associated adjustments both to the major leagues and life in the United States under his belt could help Tomas take a meaningful step forward this season, but that has not been the pattern for his fellow Cuban defectors. Among Cuban hitters who did not spend prolonged time in the minors (Tomas played a grand total of five games there), Yoenis Cespedes, Yasiel Puig, Jose Abreu, Yunel Escobar, Alexei Ramirez and Dayan Viciedo were all better in their rookie seasons than in their second major league campaigns. Even if Tomas is able to pull himself up to replacement level this season, simply swapping out Inciarte for Tomas could result in five-win drop in value for the Diamondbacks in the outfield, if not more. According to park-adjusted defensive efficiency, the Diamondbacks were merely an average defensive team in 2015, ranking 15th in the majors with a nearly league-average rate of turning balls in play into outs. That’s surprising given that two of their outfielders, Pollock and Inciarte, and their four primary infielders—Goldschmidt, second baseman Chris Owings, shortstop Nick Ahmed and third baseman Jake Lamb—all rated above average individually, with Ahmed, Enciarte and Pollock all ranking among the best fielders in baseball at their respective positions. That gives you an idea of just how poor Arizona’s other fielders were, and how much damage Tomas was able to do in just 92 starts in the field. "He is more of a one-dimensional player—he has power—that would fit better in the American League. They thought coming into camp last year he was going to play third. That didn't last long. He's adequate at best defensively. In leftfield, he's going cost you some out there. He had to get his body under control last year, but reports are he's in better shape. There were strides toward the end of the year—his patience, his pitch recognition, his power started showing up. He's the guy they've got money into, but he just doesn't have the versatility to move him around defensively.​"
"He's arguably the best in the game at that position and he doesn’t quite get the love he should. He's as good as it gets on both sides of the ball. He has special hands to hit. His bat control is elite. He's able to use the whole field. He doesn't try to do too much—he'll hit the mistakes for power and hit pitchers' pitches the other way. He has above-average range, very good hands, good feet around the bag. I've got no reason to think he's not going to be in the mix for MVP—and he's just scratching the surface and entering his prime.​"